When I think of Philadelphia, the first thought that comes to mind is the cheesesteak. Not exactly the healthiest of all notions. But the second thought I have? Is of Rocky. What is more inspirational than Rocky running up the steps to the Philadelphia Museum of Art? I can’t think of anything much more quintessentially fit-Philly than that. 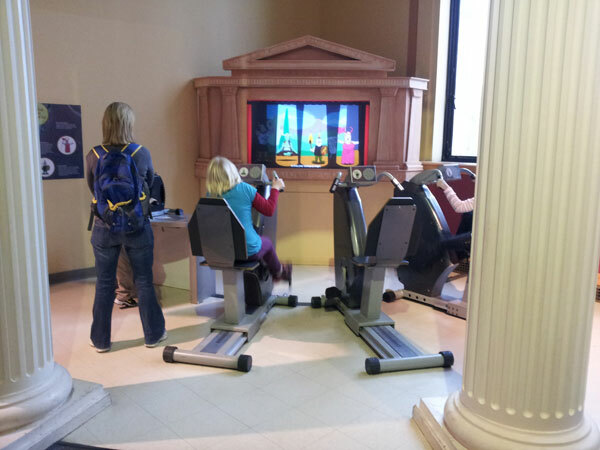 But the fam and I recently took a trip to the City of Brotherly Love and came across another site filled with healthy inspiration: The Franklin Institute. The Franklin Institute is full of exhibits that are tons of fun for kids and parents alike. One cardiac-heavy exhibit was about all things heart. And there was a ginormous walk-through heart that stole the show. It’s so big that it would be an accurate size for a human who is 220 feet tall. The 2-year-old would have climbed through the giant heart all day. A fun tunnel allows kids to crawl through an artery. A replicated surgical area for open heart surgery makes you really want to avoid landing on the operating table—particularly when you see all the surgical instruments. A talking vending machine tells you all about nutrition of common vending machine items—and made me think it would be totally brilliant if you had that option before you buy at a real vending machine. Biking to get cartoons to play should be a requirement for all kids! A reminder you’re not just hitting the elliptical to look good! You want strong bones too. 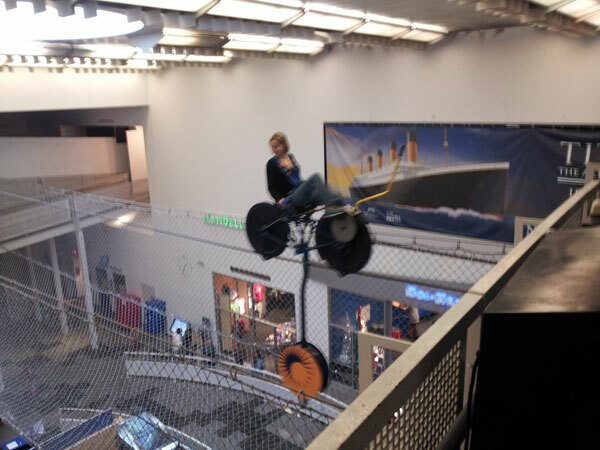 One exhibit was based entirely on sports, and then last but not least there was the Sky Bike, which I totally had to try. It’s a bike you can ride 28-feet above the ground across a 60-foot wire. A 250-pound weight prevents it from tipping over, although you can tip back and forth to play with the center of gravity. The picture is blurry because I was biking so fast. In the sky! Just kidding. Seriously, when else would I have the opportunity to essentially tightrope bike in the air? It was pretty crazy. I did try to lean to get it to tip back and forth, but I’ll admit that while I tried, I didn’t try very hard. I grew up in Philly and the Franklin Institure was my favorite museum as a kid. 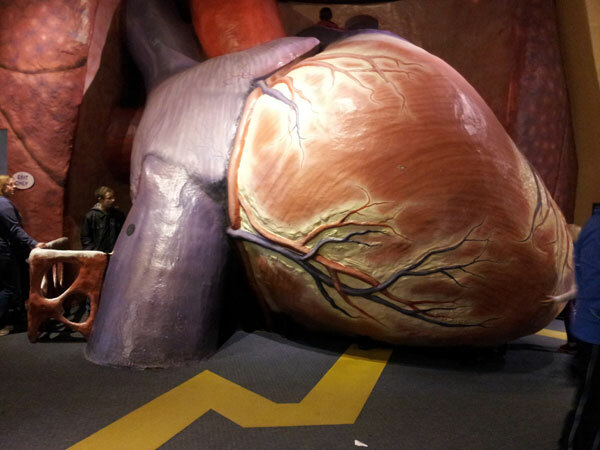 The “Heart” was always the highlight of the trip, it was like an educational playground. Thanks for this post, it brought back so many memories and on my next trip home I may have to stop by the Institute and visit the old ticker. 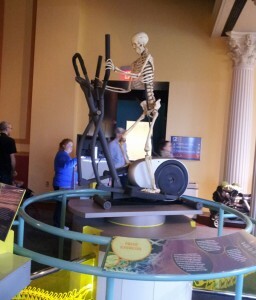 I love the Franklin Institute, especially the heart exhibit! I grew up in Philly, and we’d go there every few years. This blog made me nostalgic. Growing up in Philadelphia, the Frqnklin Institute was my favorite place to visit with my mother and my siblings. We could and did spend hours there, learning fun new things, though I didn’t know at the time my mom took us there to learn lol. Thanks so so much for shining a light on the healthy attractions of my hometown.